The United States on Tuesday urged Russia to pull out Abkhazia and South Ossetia, the Kremlin-backed separatist regions of Georgia. Russia recognized both as independent a decade ago, and Moscow has a significant military presence there. "Our position on the Russian occupied Georgian regions of Abkhazia and also South Ossetia is unwavering. That remains unwavering today. 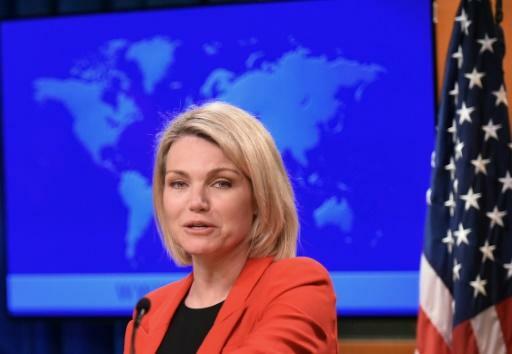 The regions are part of Georgia," said State Department spokeswoman Heather Nauert. "They are not part of Russia and the United States continues to support Georgia's sovereignty, its independence and also its territorial integrity within the internationally recognized borders," as of the 2008 ceasefire, she stressed. Her comments came hours after Georgian President Giorgi Margvelashvili condemned Russia's continued "occupation" of its territory. Moscow and Tbilisi have long clashed over the small, former Soviet Caucasus republic's wishes to join the European Union and the transatlantic military alliance NATO, a potential outcome Russia sees as dangerous encroachment on its zone of influence. In summer 2008, tensions turned into conflict when the Russian army intervened on Georgian territory to fly to the aid of South Ossetia, where Tbilisi had launched a deadly military operation. In five days, Moscow's forces routed the Georgian army and threatened to take the capital. A peace deal negotiated by then French president Nicolas Sarkozy finally led to the withdrawal of Russian troops, but Moscow recognizes the independence of the separatist regions in a major strain in East-West relations.